Okay thanks. Use just a tail hook? Has this become an obsession?! - Bomber 16A Floating (7/8oz) in black/purple (for night) and orange-y bone type color (for day). Swimmers for just below the surface. - Rebel Jumpin Minnow 4.5" bone color (1/2oz). Topwater splasher. - Tsunami Talkin Popper 4" black/silver color (7/8oz). Topwater splasher for night. 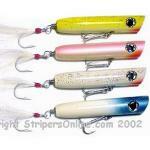 - Storm Rattlin' Saltwater Chug Bug 3 1/4" in white/yellow color (3/8oz -- but wish I got the 1oz 4 3/4" version). - Hogy Protail Paddle 3.5" bone pre-rigged (1oz) -- heaviest lure I have for this rod but it will be for deeper in water column off of my boat -- not planning on snapping a big cast with this one as it may overpower this rod. - Hogy Original 7" (white, black) & weightless 6/0 Owner keeper hooks. Topwater. I am going to focus on using the softbaits and bucktails this season. I can see myself not using 80% of these and just using the 1/2oz bucktails, DOA jerkbaits in glow color, and shads. What else am I missing to round out the light tackle (sub 1oz) lure collection? You're doing the right thing. You can learn a lot here. Al Gags makes some light paddle tail jigs that work. Just a note, most people don't use pencil poppers at night, though I'm sure anything can work.